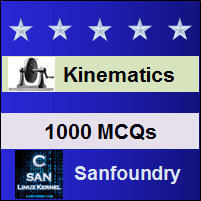 This set of Machine Kinematics Multiple Choice Questions & Answers (MCQs) focuses on “Kinematic Link or Element”. 1. In a reciprocating steam engine, which of the following forms a kinematic link? Explanation: Each part of a machine which moves relative to some other part, is known as a kinematic link. The piston and cylinder in a steam engine, form a pair and the motion of the piston is limited to a definite direction relative to the cylinder irrespective of the direction of motion of the crank. 2. A link or element need not to be a rigid body, but it must be a resistant body. Explanation: A body is said to be a resistant body if it is capable of transmitting the required forces with negligible deformation. A link or element need not to be a rigid body, but it must be a resistant body. 3. A railway bridge is an example of a machine. Explanation: When a mechanism is required to transmit power or to do some particular type of work, then it becomes a machine. A railway bridge remains static and there is no motion in it. Hence, it is not a machine. Explanation: When the motion between a pair is limited to a definite direction irrespective of the direction of force applied, then the motion is said to be a completely constrained motion. 5. The motion between a pair which takes place in ____________ is known as incompletely constrained motion. Explanation: When the motion between a pair can take place in more than one direction, then the motion is called an incompletely constrained motion. 6. When the connection between the elements forming a pair is such that the constrained motion is not completed by itself, but by some other means, the motion is said to be a completely constrained motion. When the connection between the elements forming a pair is such that the constrained motion is not completed by itself, but by some other means, the motion is said to be a successfully constrained motion. Explanation: When the motion between a pair is limited to a definite direction irrespective of the direction of force applied, then the motion is said to be a completely constrained motion. In all the above mechanism, motion is limited, so they all are examples of completely constrained motion. Explanation: When the motion between a pair can take place in more than one direction, then the motion is called an incompletely constrained motion. A circular bar or shaft in a circular hole, is an example of an incompletely constrained motion as it may either rotate or slide in a hole. Explanation: When the connection between the elements forming a pair is such that the constrained motion is not completed by itself, but by some other means, the motion is said to be a successfully constrained motion. so, the above examples have successfully constrained motion.